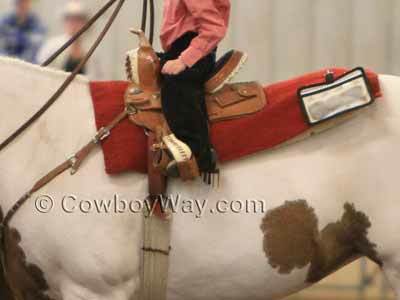 It’s important to know that saddles with full quarter horse bars – or the other types of bars mentioned above – are for any breed of horse, not just Quarter Horses. It’s also important to know that saddles with full quarter horse bars can be in any type of saddle: A roping saddle, barrel saddle, trail saddle, and so on. For more information, please scroll down for a brief article beneath the saddles for sale. 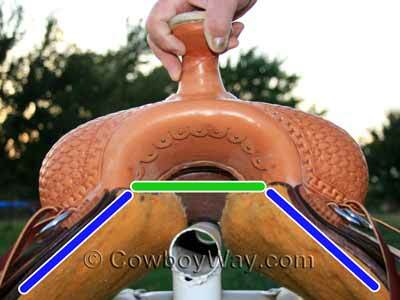 Below: The green line represents the width of the saddle tree, and the blue lines represent the angle of the saddle bars. Saddles with full Quarter Horse bars have comparatively wide saddles trees with flatter angles. Below are saddles with full quarter horse bars (FQHB) for sale from several major online sellers. About Saddles With Full Quarter Horse Bars On eBay -You can usually find all brands, new and used. When buying a saddle on eBay read the description carefully. Not everyone understands saddle trees and saddle bars correctly, and even an honest seller can make a mistake. Semi-quarter horse bars have the narrowest saddle tree and the steepest bar angles. It’s important to know that a saddle with full Quarter Horse bars made by one saddle maker might have a different tree width and bar angle than a saddle with full Quarter Horse bars from a different saddle maker. This is because there is not an industry wide standard for these terms, and each saddle tree maker sets their own standards. It’s also important to know that saddles with full quarter horse bars, or any other type of bars for that matter, can be in any type of saddle: A roping saddle, barrel saddle, trail saddle, etc. In other words, the description of the saddle’s bars refers to the fit of the saddle, not the type of saddle. The saddle tree, whether it has full Quarter Horse bars or some other type, is made to fit the horse, not the rider. The saddle seat is a separate manner. As shown in this photo, saddles can have trees to fit large, mature horses, but seats to fit even very small riders.